Does your camera system meet the specific technical needs of your project? It is no doubt versatile, but is it really the best choice for high speed, green screen, low or dynamic light, or portability? Are you giving yourself too much to fix in post? Adding extra frames of slow motion, dealing with green screen artifacts, noisy blacks and blown out highlights, these are all limitations productions come to regret. For special situations, altering the technical approach or even the camera system itself makes all the qualitative difference. Biting the bullet and changing strategies can save time, money and heartache in post. Let’s look at some of the more common circumstances that merit an alternative approach. Each scenario demands specific strategies, but common themes emerge. The author works with the Odyssey 7Q (for false color), FSI CM250 in PBP mode (color reference), LG 21:9 GUI with Scope Box up, GeChic 13 inch GUI with Pomfort LiveGrade up, Tangent Ripple color panel, various card readers and accessories. RoboCup. At high frame rates, you need to beware of significant sensor crops, higher image compression ratios, and low sensitivity (ISO). There are two primary issues. Increased frame rates can exceed the capabilities of the recording media. They can also exceed the internal processing capabilities of the camera itself. A 10x increase in processing and compressing equates roughly 10x as much work. Camera systems regularly adopt two methods to mitigate these issues. First, most camera systems reduce frame resolution to compensate for high data rates, in a couple of ways. They can capture the full sensor image, as in a normal speed recording, then down-rez it internally before compressing and writing to media. Or, they can crop the sensor and record the smaller area to generate a smaller frame size. The down-rez option is more processor intensive. The camera does the work internally, usually just to maintain a low data rate (and less processing of compression). Cropping cuts down on processing, but tosses out much of the frame,effectively punching in on the shot. Certain situations demand one method or the other, but full-frame recording at least maintains a consistent look. The second method most cameras use to reduce data rates at high frame rates is higher compression ratios. This can obviously lead to reduced quality or reduced flexibility to adjust the image in post. One final consideration when preparing to shoot high frame rates is the native ISO rating of the camera. High-speed shooting requires more light to maintain good exposure—at very high frame rates, a tremendous amount more light. A camera with a higher native ISO rating reduces this need. What frame rate do you need? High speed modes tend to improve with each iteration of camera systems. As each generation adopts higher capacity, faster recording media, as well as faster processors, and sensors, they handle high frame rates with fewer tradeoffs. But overcranking still requires that you avoid pitfalls, and prepare for those you can’t avoid. As of this writing, the Phantom system exclusively shoots at frame rates over 120 or 200 without significant compromise. Ask yourself (and test where possible) whether you really need extreme high frame rates. Even in fast-action sports scenes, 200 FPS is often optimal, particularly when the trade-offs are considered. For instance, RED camera systems allow you to shoot at some very high speeds, but with all the compromises. The sensor crops down to 2K/HD or below, REDCODE compression ratio needs to be set very high, and high ISO ratings or low light conditions further compromise fidelity. An image that looks great at 5K and 7:1 compression quickly starts to fall apart at high speed on the RED, particularly at 2K and 13:1 compression. The RED image is typically shot at 5K+ but viewed in HD, which makes it look exceptionally clean. This down-res does wonders for noise reduction. With a cropped sensor, the downsizing effect is removed, and you start to see noise and ugliness that scaling hides. Add a need for more light to avoid underexposure, and the extra REDCODE compression, and you have a recipe for noisy disaster. The Alexa mini is a bright spot among current camera systems for low-compression slow motion. One current bright spot is the Alexa Mini and Amira cameras. They are capable of shooting up to 200fps with less compromise. These cameras capture the same sensor area and resize in camera, so the image still looks clean. They also don’t need to reduce the compression below standard Prores 4444. The resulting frame size, however, is limited to 2K or HD at 200fps, which may be too small for some projects. If that is the case, then it’s Phantom to the rescue. For color keying, it’s best to avoid heavy compression, to record at higher resolution than the delivery spec, and to capture an especially clean green channel. Camera systems that shoot to heavily compressed formats, such as XAVC or other MPEG based compression methods, may work perfectly well in day to day filming.But they create image artifacts that can be hard to perceive, yet impact the ability to pull a clean key. An overexaggerated version of bad JPEG-like spatial compression. We all know what bad compression looks like. It could be a badly compressed internet video or low quality JPEG compression on a still image. You may have noticed these aberrations are particularly prevalent along edges and in areas of low contrast. A green screen key demands as clean an edge between subject and background as possible, with minimal contrast lighting on the green screen itself. Therefore, always shoot with the least amount of compression the camera will allow. For instance, Alexa has Prores XQ or ARRIRAW options, and a RED can be set to a 3:1 REDCODE setting. If the camera system permits, use an external recorder to record RAW or a clean format like high quality Apple ProRes. This is one scenario where you really do want extra resolution. Shooting green screen at a multiple of the delivery resolution helps deliver a clean key with good edges. Down-rezzing reduces overall image noise. It helps define contrast edges. Both of these help pull a key and hide compositing problems in the final image. If the delivery is HD, consider shooting, say, 3.2K on an Alexa, or UHD on a Sony, or 5K+ on a RED. One thing to definitely avoid is shooting at a resolution that is uprezzed in camera. For instance, the Alexa Mini offers a UHD record mode. However this mode captures the sensor at 3.2K and then performs a high quality in-camera resize to UHD. This is normally a perfectly good way to deliver a 4K image from an Arri, but for green screen it softens edges and complicates keying. RED is a good alternative to shoot at a higher-than-4k resolution for 4k delivery. Finally, you want to make sure the green channel is as clean as possible. Luckily the CMOS sensors popular in modern camera systems naturally help with this. The Bayer field system has twice as many green receptors as it does red and blue. But some cameras such as RED will perform better if you use all daylight balanced lights. This image captured with a daylight balanced RED camera clearly shows more noise and grain in the blue channel. Another smart move is over exposing the image a little (while still protecting highlights, of course). Rating the RED at a lower ISO such as 640 or 320 delivers a cleaner image, if you have the light. And overexposing the Sony helps a lot with reducing the noise floor. Since these are effects shots, you want extra flexibility in post. Overexpose the image a bit to retain clean detail in the shadows, and you can easily crush the shadows later to restore contrast. The extra detail can help the VFX artists immensely as they construct the scene and match other elements. A noisy image means more clean up in post, or adding noise to match every other element in the scene. Let’s sidestep for a moment the possible controversy of why one would shoot low light instead of putting more light on a scene. After all, there may be creative reasons or practical reasons to shoot in very low light, and it’s achievable to do so. Here the issue is really just exposure and noise. Native ISO is the most important factor. Most camera systems don’t perform well if you rate them at an ISO different from their native one—especially if you raise the ISO. This usually just reduces the overall exposure range, or uses artificial tricks like gain to brighten the image. It also exposes additional sensor noise, or raises the noise floor to unacceptable levels. Choosing a camera with a higher native ISO will help. The problem here is most cameras don’t have a drastically higher native ISO. Some Sony systems are rated at 2000. While they get the full dynamic range at this ISO rating, they also are pretty noisy and generally need to be “overexposed,” especially if the scene is dark. This in turn reduces some of the practical effect of such a high native ISO. You also should avoid high compression formats that struggle with low-detail shadows and muddy the image. So what cameras work in low light? Ideally low light projects are shot on a camera with a high native ISO, low compression or RAW output, or at least some sort of LOG format. Currently one of the best sensors for low light is in the A7S line from Sony. These cameras can truly, properly expose at extremely high ISO ratings. There is plenty of interesting footage shot with candles, moonlight, or the glow of a phone screen as the only light source to prove it. But this is not a fully fleshed camera system in other ways and comes with plenty of caveats. Internal recording is highly compressed, but you can use an external Prores recorder to circumvent that problem. The image can still be rather noisy, so shooting at 4K and downsizing can help with this. The camera can also be rather tricky with its picture profile modes. Some of the more advanced LOG curve modes seem to produce an image with a lot more noise, and using a cleaner more contrasty setting reduces flexibility in post. Another good option if you don’t need extreme low light is the often overlooked VariCam 35. This camera has an effective 5000 ISO mode, shoots LOG that is very similar to the Alexa’s Log-C in character, and even has a RAW capable version now. For true HDR, options are still pretty limited. You’re best off using a camera that has HDR recording modes, such that RED offers. The possible issues using this mode though are that you are essentially capturing 2 images for each frame of video. Therefore, the effective frame rate doubles in this mode and all the above consequences (from High Speed above) apply. Very fast motion in the scene, snap pans or other quick camera movement all make the combined images mismatch slightly. Finally, only additional post processing will produce an HDR image with good results. The log curve that is natural to negative film can be applied to digital files to give a smoother highlight roll-off than the flat cut-off of standard linear digital image capture. If you are shooting a high contrast scene but not finishing in HDR, it’s essential that you record with LOG curves or in a RAW format to preserve the highest and lowest ranges of exposure. Cameras such as the Alexa, use a very complementary highlight shoulder that lets you overexpose a fair bit if the main subject is not in the highlight range. Avoid shooting high contrast scenes with cameras that have an 8 bit sensor. They clip easily and produce that ugly video-like highlight clamping. Look for a camera with 14+ stops of dynamic range, LOG or RAW recording, and a 12 bit+ sensor and recordings. There is not too much to say definitively on this subject. Sometimes VFX needs higher frame sizes. I tend to say a K count, especially above 2.5K or so, is not of primary importance for consumption, but there are projects that require higher resolutions. You just need a camera system and lenses that support the highest resolution possible, without adding too much frustration to the process. Increased data rate and data management are issues. Higher compression levels trigger the loss of those detailed Ks. The camera exhibits lower light sensitivity as the light receptors on the sensor get smaller. Lens coverage can be problematic with larger sensors. How much bigger is 6k than HD? Here’s a proportional chart. RED has had a leg up here. They’ve generally stayed ahead of the K game and recently released 8K hardware. If you have a big project and a big budget, the Alexa 65 is an amazing 6K camera, but the camera and data workflow are nothing short of monstrous. Many productions have relatively modest technical needs that can be handled by virtually any contemporary A camera. But in an era where even a DSLR or equivalent is still considered sufficient or even optimal, specific shots may exceed what is possible with that camera. Making do with your A camera can lead to costly fixes in post. If you want 200fps slowmo but your camera only does 96fps at the resolution you need, correcting that problem may require many man-hours of Twixtor and hand-painted fixes. Likewise, compression can ruin a green screen. A DP who knows the camera will avoid getting into trouble with low light and high contrast, but not all productions take place in a 100% controlled setting. And regardless of your feelings about increased resolution, it’s a target that more and more productions may be be required to meet. 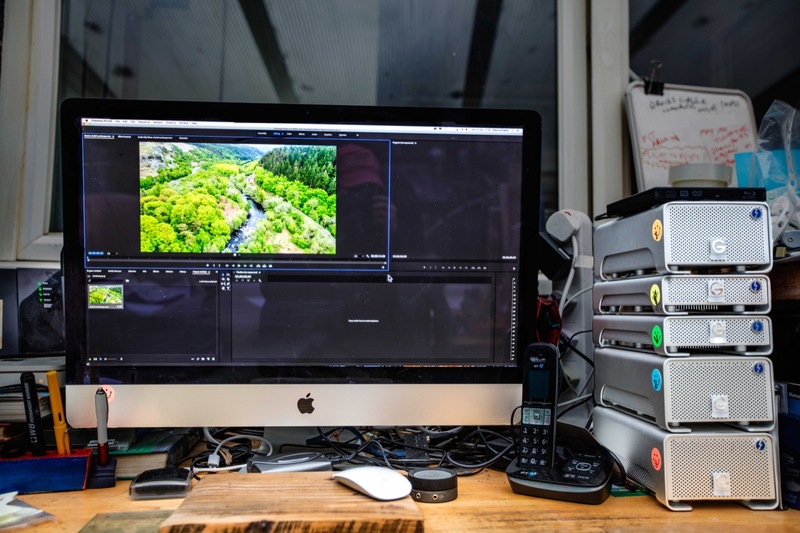 If you find yourself needing a camera to make the post-production process work, and it’s a camera with which your DP is unfamiliar, bringing in a separate package may feel almost like a whole separate shoot. Lighting for the Phantom is different than for other cameras. But if you work in post and are fortunate enough to be included in production, think about what you need, and consider a strong request where applicable. Thank you to Sin Cohen for contributing this article. Sin is a freelance Local 600 DIT and Post Production Supervisor in the San Francisco Bay Area. He started his career at Francis Ford Coppola’s private film production company American Zoetrope, where he was the backbone of post production for several years. He manages general post production, information technology and sound post production. He has managed and supervised the IT needs of several post production facilities in the Bay Area, spanning from servers and networking, installation and maintenance of theatrical screening environments, sound mixing, editorial, visual effects, finishing and grading equipment. He has also contributed to the sound mixing of various American Zoetrope productions, working directly for Francis Ford Coppola, Walter Murch, Richard Beggs, Roman and Sofia Coppola and others. As a DIT he has worked with dozens of cinematographers on hundreds of projects including over a hundred commercials, as well as some feature films, short form films, TV episodics, and documentaries.